TRACLabs' affordance template software provides a general purpose task representation and execution framework that can easily be applied to different robots and different environmental contexts. 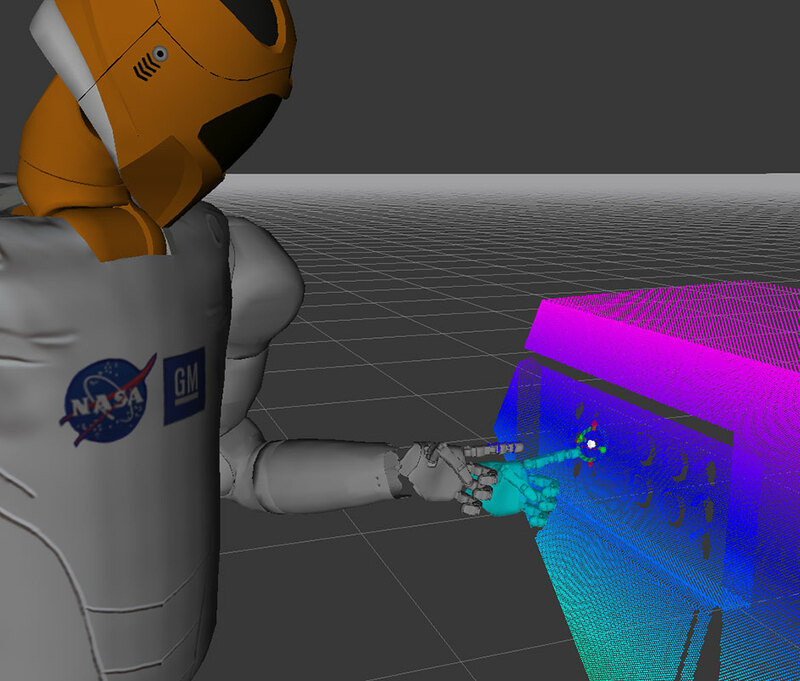 An affordance template is a construct that contains virtual 3D visualizations of task-relevant objects (e.g., a handrail or tool), and robot waypoint goals (for reaching out and/or interacting with these objects) that a human operator can adjust at run-time to fit the demands of the run-time context. The operator can command the robot to plan and execute strategies through these goals to accomplish a variety of complex behavior. The affordance template software has been implemented in ROS and is used with the RViz 3D interactive user interface and is available open source from https://bitbucket.org/traclabs/affordance_templates. S. Hart, P. Dinh, and K. Hambuchen. The Affordance Template ROS Package for Robot Task Programming. In Proceedings of the IEEE International Conference on Robotics and Automation (ICRA), 2015. S. Hart, P. Dinh, and K. Hambuchen. Affordance Templates for Shared Robot Control. In Artificial Intelligence and Human-Robot Interaction, AAAI Fall Symposium Series, Arlington, VA. USA, Nov. 2014. J. James, Y. Weng, S. Hart, P. Beeson, and R. Burridge. Prophetic goal-space planning for human-in-the-loop mobile manipulation. In Proceedings of the IEEE RAS Humanoids Conference, Seoul, Korea, November 2015.